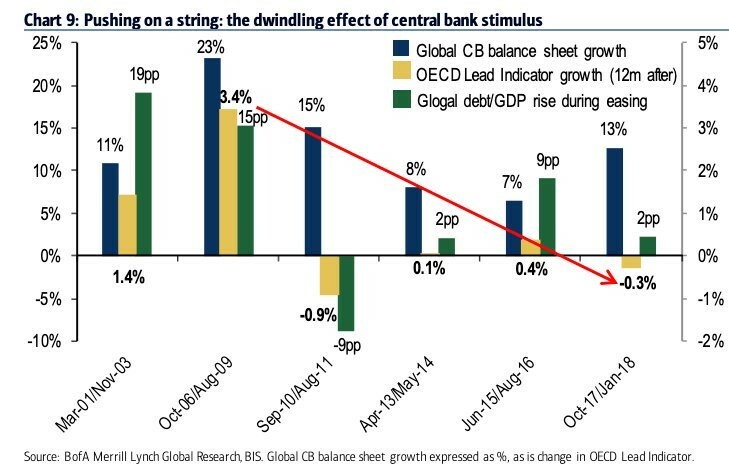 Global Central Banks - Could The Economy Be Mid-Cycle? Some investors believe the economy couldn’t possibly be mid-cycle because the expansion is already almost the longest since the 1800s. Ignore how long you think expansions should be. Technically, the mid-cycle slowdown in 2011-2012 wasn’t close to the middle of the cycle. This expansion has already had 2 mid-cycle slowdowns. If this slowdown doesn’t become a recession, it will be the 3rd. That doesn’t mean the expansion will last another 5 years. If the economy recovers in the 2nd half of 2019, there could still a recession in 2020 or 2021. To be clear, the ECRI leading index is now down 4% year over year instead of 4.3%. It was down 6.5% in the first week of January, which means the likelihood of an acceleration in growth in the 2nd half of this year has increased. The chart below reviews the previous mid-cycle Fed pauses. 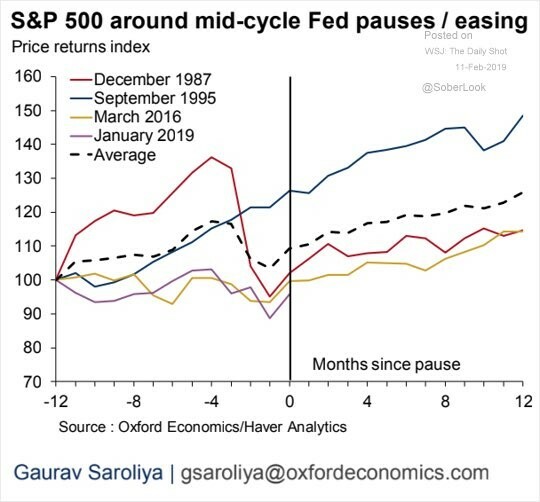 I explained why this could be another mid-cycle slowdown because some investors look at this chart and say it’s impossible for there to be 2 mid-cycle Fed pauses in one expansion. As you can see, stocks usually rise after the Fed pauses its rate hikes. It’s no surprise dovishness pushes stocks up. Investors go from thinking a recession is coming, to realizing the expansion has at least a few quarters left. Many investors don’t even realize that the Fed pausing rate hikes doesn’t mean a recession is coming because mid-cycle pauses are rare; the last one happened in 1995. In theory, if the Fed avoids tightening too much, it can have several pauses which extend the expansion. The critical aspect which allows the Fed to pause hikes is low inflation. Since we have low inflation, it doesn’t seem like the Fed needs to hike so much that it causes a recession. It’s no surprise that with the slowdown in developed markets and China, global central banks are easing rates. 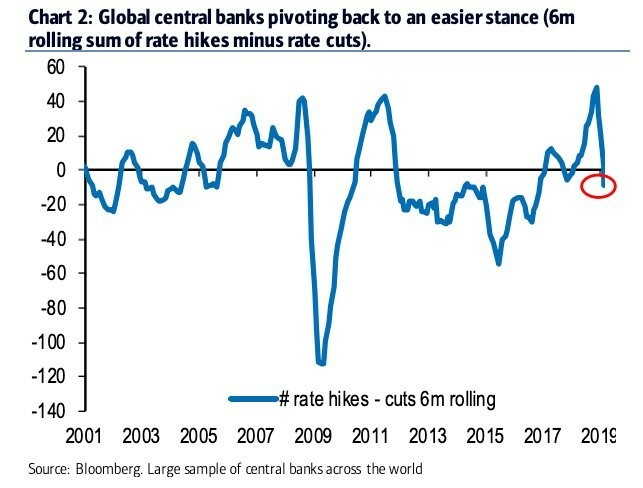 The chart below shows the 6 month rolling sum of rate hikes minus rate cuts. Interestingly, even though the Indian economy is the strongest of the emerging markets, its central bank cut interest rates 25 basis points to 6.25% on February 7th. That’s while GDP growth was 7.1% in Q3, which slowed from 8.2% in Q2. India’s Q4 GDP report will come out on February 28th. Its central bank is neutral which is a dovish shift caused by inflation being 2.05% in January 2019 which is much below its 4% target. The central bank is expected to cut rates again because Prime Minister Modi is seeking re-election. These global central bank cuts help the dollar which should also be helped by America outperforming other developed markets. I have been bearish on the dollar this year because Merrill Lynch’s fund manager survey showed being long the dollar was the most overcrowded trade. The dollar index is up 0.58% year to date as it has been stagnant since October 2018. I need to rethink my bearishness because global central bank cuts cancel out the Fed’s dovish rate hike pause. Leading up to the volatility in U.S. equities in Q4, central banks had been hawkish. The Fed raised rates 4 times in 2018, the ECB wound down its balance sheet expansion, the Fed’s balance sheet shrunk at a $50 billion per month rate. In the chart above it shows rate hikes were briefly the highest since at least 2001. As you can see from the chart below, the OECD leading indicator was negative at the start of 2018, global debt to GDP barely rose, and central banks’ balance sheets rose 13%. If this chart extended to the end of 2018, it would show a more hawkish picture. The fiscal stimulus boosted America’s deficit since this data was calculated. I disagree with the title in this chart because stimulus was much greater in 2009 than it was in late 2017/early 2018. I think the Fed has ammo it its gun to deal with a future recession as it can cut rates. I’m not sure if increasing the balance sheet would stimulate growth. But it could do another round of QE. The ECB is in tougher shape with its negative interest rates, high balance sheet to GDP ratio, and slowing growth. The chart on the left shows firms with strong balance sheets are much more expensive than weak balance sheet firms. They are always more expensive, but the strong balance sheet firms’ forward PE being 1.7 times that of weak balance sheet firms is in the 94th percentile. Telative price to book value is in the 91st percentile. Free cash flow yield is in the 85th percentile. Enterprise value to EBITDA is in the 77th percentile. EV to sales ratio is in the 69thpercentile. Average valuation metric is in the 85th percentile. Usually, weak balance sheet firms do better when the Fed is done raising rates. That implies you should buy them now since they are relatively cheap. Strong balance sheet firms have a 13% long term growth rate, while weak balance sheet firms have an 8%long term growth rate. Personally, I look at this dichotomy a bit differently. I would buy the firms with high debt and high growth, like Netflix, during volatility events. While I would buy the strong balance sheet firms with low growth during situations like now where stocks are overbought. It’s notable that low growth firms like General Mills and Altria have leveraged up their balance sheets through acquisitions which has put them out of favor. These firms’ investor bases consist of people who want dependable low growth which isn’t dependent on the economy, while being rewarded with big dividends and buybacks. The issue is it’s impossible to run a stable company with low growth forever because trends change such as consumers wanting healthier breakfast items and vaping. It’s in these firms’ long term interest to make smart acquisitions. A question isn’t if they should make moves. It’s “which firms do they buy” and “what price do they pay”?